Wabash students affirmed their support for the Challenge of Excellence campaign Thursday when they presented a $25,000 check to President White. “The Senate, over the past two years, decided to reach that $25,000 goal, and with the money reverted from clubs last semester, we were able to make our final payment in the amount of $16,500,” Current Senate President Alex Robbins ’12 said. 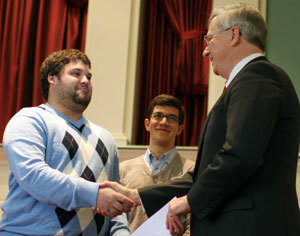 Robbins presented the final check to President Patrick White Thursday before the weekly Chapel Talk. The $60 million campaign for student scholarships, faculty support, study abroad, and career success currently stands at just over $52 million. The student contribution will go toward the scholarship fund. Grossnickle praised student leaders for taking the initiative to make a contribution.